Here at Canadian Turkey, I’ve been tooting the turkey protein horn pretty loudly. And for good reason: turkey is packed with high quality protein that can help you feel energized and satisfied and keep your muscles and immune system strong. When it comes to foods that are protein-rich, both traditional protein sources (e.g. turkey) and plant-based foods (e.g. legumes, lentils, nuts) provide their own unique package of health-boosting nutrients. Both offer benefits beyond protein. Both can be part of a healthy plate. In fact, combining traditional protein sources with plant-based foods can mean more nutritional bang for your buck. What does that mean? Well, firstly you get a wider variety of nutrients. But also, it creates a super food synergy, with certain nutrients working together to increase absorption of other nutrients in your body. Turkey boosts intake of energizing iron. Although Popeye might be known for eating spinach to get his muscle-energizing iron, he should be pairing that spinach with turkey! Meat, including turkey, contains heme iron, which is a type of iron that is easily absorbed by your body. Plant foods, such as spinach or pulses, also contain iron (non-heme iron), but it’s not as easily absorbed by your body. Eating meat, such as turkey, boosts the absorption of plant-based iron. Perfect Pairing: Turkey + Iron-Rich Lentils. This Smokey Turkey Lentil Chili takes chili up a notch making it even more nutritious and doubly delicious through the combination of lentils and ground turkey. Turkey helps you absorb plant-based zinc. Think of the mineral zinc like your inner boxer; it’s a key nutrient that helps your body fight off infections and heal wounds. 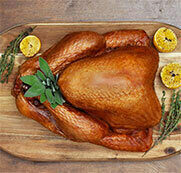 Turkey contains zinc that your body can easily absorb. Although you can get zinc from plant foods (e.g. whole grains), your body absorbs the zinc found in animal foods, like turkey, more easily. Like iron, zinc from plants is more likely to be absorbed when eaten with traditional protein sources. Perfect Pairing: Turkey + Zinc-Rich Whole Grains. You’ll love this Apple Wheatberry Turkey Salad featuring wheat berries and turkey together in a tangy citrus dressing. Added bonus: the Vitamin C in the citrus helps absorb the iron in the grains and turkey too! Turkey helps you absorb some veggie vitamins. All fresh turkey cuts (without the skin) are lean or extra lean; but they do contain a small amount of fat…and that’s okay! We need fat for energy and important functions in the body. Fat also helps you absorb the fat-soluble vitamins A, D, E and K found in vegetables and fruits. Perfect Pairing: Turkey + Vitamin A- and K-Rich Dark Leafy Greens. This Grilled Turkey Scallopini with Kale Walnut Pesto is scrumptious and super simple, making it a quick meal any day of the week.